by various sources. August 2, 2011. 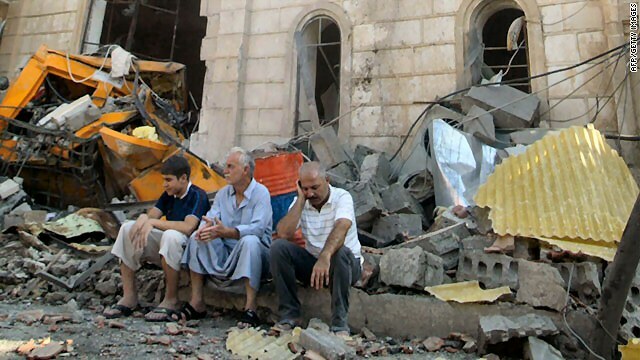 SULAIMANIYAH, Iraq — A car bomb outside Holy Family Syrian Catholic Church wounded 23 people Tuesday, August 2, 2011, as security forces found and disabled other vehicles packed with explosives outside two other churches in northern Iraq. by Associated Press. August 2, 2011. SULAIMANIYAH, Iraq — A car bomb outside a Christian church wounded 23 people Tuesday as security forces found and disabled vehicles packed with explosives outside two other churches in northern Iraq. The bombing and the two averted attacks in the northern city of Kirkuk signal continued violence against Iraqi Christians, nearly 1 million of whom have fled since the war began in 2003. "The terrorists want to make us flee Iraq, but they will fail," said the Rev. Haithem Akram, the priest of one of the churches that was targeted. "We are staying in our country. The Iraqi Christians are easy targets because they do not have militias to protect them. The terrorists want to terrorize us, but they will fail," he added. The car blew up outside the Syrian Catholic church at about 6 a.m., severely damaging the church and nearby houses, police Col. Taha Salaheddin said. The parish's leader, the Rev. Imad Yalda, was the only person inside at the time of the blast and was wounded. The 22 other wounded were people whose nearby homes were hit by the blast, Kirkuk police chief Maj. Gen. Jamal Tahir said. Following the blast at the Syrian Catholic church, police discovered two more car bombs parked outside the Christian Anglican church and the Mar Gewargis (St. George) church, both in downtown Kirkuk. The ethnically and religiously mixed city of Kirkuk is located 180 miles north of Baghdad. Sunni extremists often target Christians who are seen as unbelievers. Violence against Christians stepped up late last year, climaxing in the Oct. 31 siege of a Catholic cathedral in downtown Baghdad that left 68 dead and scored wounded when al-Qaida suicide bombers held worshippers hostage for hours before detonating their explosives belts. Since then, the Vatican and the U.S. Congress have pleaded for Iraq's government to do more to protect Christians in Iraq. A State Department report says Christian leaders estimate that 400,000 to 600,000 Christians remain in Iraq, down from a prewar level of as high as 1.4 million by some estimates. Baghdad (CNN) — A car bomb exploded outside a Catholic church in central Kirkuk, Iraq, early Tuesday, wounding at least 20 people, authorities said. The attack took place in Kirkuk's Shatterlo neighborhood around 5:30 a.m. (10:30 p.m. Monday ET), according to a police official who spoke to CNN on condition of anonymity because he was not authorized to speak to the media. The wounded included staff from the Holy Family Church and people with homes nearby. The Interior Ministry said 23 people were injured. The explosion damaged the church and a number of nearby houses, police said. Kirkuk is an ethnically divided city located about 240 kilometers (150 miles) north of Baghdad. In the past years, extremists have carried out major attacks against churches. An October 31 attack on the Sayidat al-Nejat Cathedral, or Our Lady of Salvation Church, left 70 people dead and 75 wounded, including 51 congregants and two priests. The Islamic State of Iraq, an umbrella group that includes a number of Sunni Muslim extremist organizations and has ties to al Qaeda in Iraq, claimed responsibility for the Baghdad church siege. Religious minorities, such as Christians and Yazidis, make up less than 5% of Iraq's population, according to the U.N. High Commissioner for Refugees. Since 2003, attacks against these minorities by insurgents and religious extremists have driven more than half of the minorities out of the country, according to UNHCR statistics. by Yahya Barzanji - Associated Press | AP – Tue, Aug 2, 2011. SULAIMANIYAH, Iraq (AP) — A car bomb outside a Christian church wounded 23 people on Tuesday morning, police said, as security forces found and disabled vehicles packed with explosives outside two other parishes in northern Iraq. "The terrorists want to make us flee Iraq, but they will fail," said the Rev. Haithem Akram, the priest of one of the churches that was targeted. "We are staying in our country. The Iraqi Christians are easy targets because they do not have militias to protect them. The terrorists want to terrorize us, but they will fail." The assault began at 6 a.m., when the car blew up outside the Syrian Catholic church, severely damaging the church and nearby houses, said police Col. Taha Salaheddin. The parish's leader, the Rev. Imad Yalda, was the only person inside at the time of the blast and was wounded. The 22 other wounded were people whose nearby homes were hit by the blast, said Kirkuk police chief Maj. Gen. Jamal Tahir. Following the blast at the Syrian Catholic church, police discovered two more car bombs parked outside the Christian Anglican church and the Mar Gewargis church, both in downtown Kirkuk. The ethnically and religiously mixed city of Kirkuk is located 180 miles (290 kilometers) north of Baghdad. Sunni extremists often target Christians who are seen as unbelievers. Associated Press Writers Sameer N. Yacoub and Lara Jakes in Baghdad contributed to this report. Aug. 2 - A car bomb explodes outside a Christian church in the northern Iraqi city of Kirkuk, wounding at least 23 people. Travis Brecher reports. (Reuters) — A car bomb exploded near a Catholic Church in northern Iraq on Tuesday, injuring at least 16 people in part of a coordinated attack on Christian places of worship in the ethnically-mixed city of Kirkuk, a senior police official said. Police also found car bombs near two other churches in Kirkuk, but defused them before they exploded, the city's Deputy Police Chief Major-Gen. Torhan Abdulrahman said. The explosion blew out the windows in the Catholic church, used mostly by Syrian Christians, damaged the building and left it covered in debris, television footage showed. Outside lay the twisted black metal remains of the car bomb. "It was a coordinated attack to target churches at the same time," Abdulrahman told Reuters, saying 16 people were injured. Hospital sources said they treated 23 people wounded in the blast, including some Christians. Violence in Iraq has fallen sharply since the height of the 2006-2007 fighting between majority Shi'ites and once dominant Sunni Arabs, but bombings and shootings by insurgents and militias remain a daily occurrence. Sectarian tensions continue to fester more than eight years after the U.S. invasion that ousted Saddam Hussein. Iraq's Christian minority, mainly living in Baghdad, Kirkuk and Nineveh province, have been targeted in the past. Kirkuk, 250 km (155 miles) north of Baghdad, is also riven by political tensions -- Kurds say the city is part of their semi-autonomous region, a claim disputed by the federal government. Security around churches has been tightened since 52 people were killed last October when militants attacked Our Lady of Salvation Catholic church in Baghdad during mass. Security forces stormed the building. Iraq's minority Christians population has shrunk to about 850,000 from about 1.5 million in recent years, according to church estimates. Iraq's total population is estimated at about 30 million. Church officials believe hundreds of thousands have either left the country during of fled to other parts of northern Iraq. by Deacon Keith Fournier. Catholic Online: August 3, 2011. Since the start of the Muslim holy month, attacks have been on the rise. Tuesday morning, a car bomb exploded near the Holy Family Syro-Catholic Church at about 5:30 am wounding 15 people. Some 30 homes were also damaged. A second bomb was also found.Sadly, the plight of our brethren, the Christians in Iraq, continues to deteriorate as this war drags on. However, at least this time, the media is covering it. This is evil and it must be exposed and opposed. Pray for the Christians of Iraq! WASHINGTON, DC (Catholic Online) — We were among the first online sources to report on the evil actions of extremist Muslims which were committed against the innocent Catholic faithful of Iraq while attending Holy Mass on Ocotber 31, 2010. I wrote an article entitled, Catholics Killed at Mass in Iraq: Extremist Muslims invade Church, Murder Priests. Of course, the reaction from the Holy See was immediate. Pope Benedict XVI expressed his profound sorrow and solidarity. On the Feast of All Saints he called for an end to the "heinous episodes of violence that continue to ravage the people of the Middle East." He addressed the "grave attack on the Syrian Catholic cathedral of Baghdad, (where) dozens of people were killed and injured, among them two priests and a group of faithful gathered for Sunday Mass." The Pope called the faithful around the world to prayer saying, " I pray for the victims of this absurd violence, which is even more savage because it struck defenseless people, gathered in God's house, which is a house of love and reconciliation.... May everyone unite their efforts so as to end all violence." We received an extraordinary number of letters in response to that article on the massacre against Catholic Christians in Iraq by extremist Muslims. Many of our readers asked why this evil act of terror and violence was not covered by the mainstream media and Major Press sources. It took a while, but it finally was. As the news came out, Catholics, other Christians, other people of faith and all people of good will uniformly expressed outrage, deep sorrow and shock at the barbaric act. The sacrifice of their lives must not be forgotten. It points to the growing persecution against Catholics and other Christians in Iraq and throughout the Middle East. This is another front in a war ravaged Nation which must be reported on. However, even more importantly, it must become a concern for our leaders as they determine National Policy and negotiate for the future. Sadly, the plight of our brethren, the Christians in Iraq, continues to deteriorate as this war drags on. However, at least this time, the media is covering it. The horror of the intentional attacks against Christians by Islamic militants during the Muslim holy month of Ramadan should be condemned by all governments. It should also should draw all of us who bear the name Christian to our knees in intercessory prayer. This is evil and it must be exposed and opposed. Asia News, in an article entitled "Christians "sad and in shock," Mgr Sako says after car bomb explodes at Kirkuk church, wounding 15" reported on the events of August 2, 2011: "Iraq's Christians are "sad and in shock" because attackers targeted a "sacred place" and "innocent people", said Mgr Louis Sako. The archbishop of Kirkuk, a city in northern Iraq, spoke to AsiaNews about the latest outrage against the country's Christian community two days into Ramadan. "Since the start of the Muslim holy month, attacks have been on the rise. This morning, a car bomb exploded near the Holy Family Syro-Catholic Church at about 5:30 am (0230 GMT), wounding 15 people. Some 30 homes were also damaged. A second bomb was also found. "According to local sources, Mati Shaba, a Christian man, is among the wounded, and is in serious conditions. Fr Imad Yelda, one of the church's clergymen, was slightly injured. A 20-day-old baby and residents from the predominantly Christian and Turkmen neighbourhood of Shaterlo in northern Kirkuk were also hurt. Fr Imad Hanna, who was also injured in the attack, said, "It is the first time that this church is the object of a terrorist attack." The blast damaged the doors and inside the building (pictured), as well as cars and other buildings around the area. "Tuesday morning, Mgr Louis Sako, the archbishop of Kirkuk, visited the wounded in hospital. Many of them have already been released and gone home. Speaking to AsiaNews, the prelate said that "Christians are sad and in shock" because "a sacred place" and "innocent people" were targeted. "Many cars caught fire" and there was widespread damage in the area, he added.According to the archbishop, the attack has caused a great deal of sorrow because it occurred "at a holy time of fasting and prayer, [a time] of conversion." "We are shocked," he explained, "because Christians play no role in the political games" of the city, its centres of power and economic interests. "We are always for what is good, for dialogue, and we have good relations with everyone." "With a population of 900,000, Kirkuk is at the centre of an ethnic-political struggle between Arabs, Turkmen and Kurds. The latter would like to see the city annexed to Kurdistan, whilst Arabs and Turkmen want it to remain linked to Iraq's central government. "Local sources said that a second bomb was found in a car parked near a Presbyterian Evangelical church at al Mass, in central Kirkuk. The bomb was ready to explode but was defused. Tuesday's bombs come a month after the opening of the first church built since the US invasion of 2003." We ask our readers and viewers around the world to pray for the Christians in Iraq. We also ask for prayers for the conversion of all who perpetrate such evil while profanely claiming to do so on behalf of their God. These are acts of evil which must be exposed, opposed and brought to an end. WASHINGTON, Aug. 3 (UPI) -- Washington said it was confident the Iraqi government would take the steps necessary to ensure the minority Christian community gets the protection it deserves. A vehicle filled with explosives detonated Tuesday in front of a Christian church in Kirkuk, Iraq, injuring at least 20 people. Violence targeting the Iraqi Christian population, traditionally based in the north, displaced as much as half of the ethnic minority community in 2008. 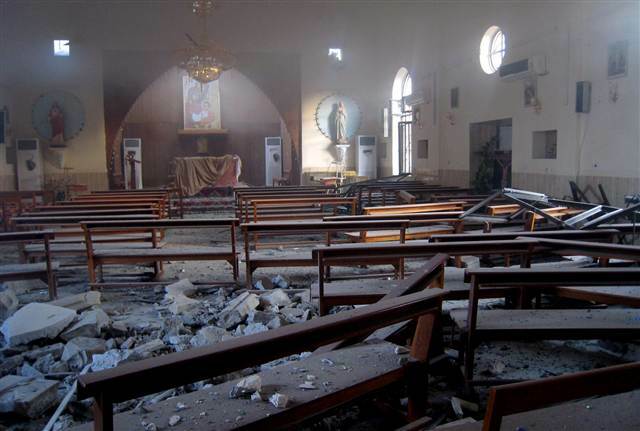 An al-Qaida attack on a Christian church in Baghdad in October killed at least 60 people and left nearly 100 injured. U.S. Secretary of State Hillary Clinton, in a statement, said attacks on the Christian community in Iraq shows the depths to which "certain terrorist groups" will go to disrupt Iraq's fragile peace. "We are confident the government of Iraq will take all necessary steps to bring the people responsible for this horrific act to justice and continue its efforts to improve the security situation for all Iraqis, including those whose communities are threatened on the basis of their faith and beliefs," she said. There were around 1.4 million Christians living in Iraq before the U.S.-led invasion in 2003. Conservative estimates report half that number still lives in the country. Arab leaders have said Christians are equal members of society in the region and deserve equal protection. Italian Foreign Minister Franco Frattini said that "Italy is committed to helping the Catholic community stay there."